Spotify is a unicorn no more. It promises to be the end all, be all solution to our music listening needs in the 21st century. And, by the beard of Zeus, they've delivered on that promise. Co-founder Daniel Ek said he wanted to create something better than pirating music. He wanted it to be fast, and simple, and free—to an extent. Spotify is a service that will let you stream all you want from a library of 15 million songs for free (for the next six months, after which it will be capped at a limited number of hours TBD). But when you want to start adding features, like listening to music on the go, you have to pay a monthly subscription fee. The killer feature, though? You can integrate your own tracks into the Spotify ecosystem for your own listening pleasure on any plan. On paper, it's the best of all worlds. Why Did It Take So Long for Spotify to Come to the US? The first time I stared at the Spotify UI on my desktop, it was a confusing and overwhelming. Instead of taking me straight to a home screen with suggestions of albums to stream, it showed my "library" and immediately started adding tracks from my computer without even a prompt. Basically I felt like I was staring at my iTunes library. Then I started clicking around, not entirely sure of what to do next. The What's New section offers a few new album and singles suggestions, but provides little in the way of advanced browsing like, say Rdio does. Linking Spotify to my Facebook account showed a handful of friends who were using the service, but there wasn't a way to explore the profiles of random users, or even easily search for friends who weren't on Facebook. Then I found the search bar, quickly realizing that was my magic ticket into the streaming world of Spotify. I ran a search for some random artist, and instead of an artist page, the primary view is a list of songs spit out at random, with my local files mixed in the results. MOG, by comparison, will organize search results by artist and album. Some results were grayed out, others had weird page icons next to them, some songs were doubled up. The visual album art element so prominent in other services was relegated to the upper 1/5 of the app. Figuring out how to add streaming tracks to my library required thought. This didn't feel intuitive at all. I wasn't sold. But I kept using it. And it got better. Once you get used to Spotify and are able to decypher its enigmatic UI (check out some great power tips here, BTW), it really becomes a powerful music tool. 15 million tracks—more than any other service—are at your disposal whether you're using the free, ad-supported service, or rocking the $10 premium plan. If you want to listen to something that isn't on the service, but is on your hard drive, you don't have to switch apps. Just import it into Spotify (if it hasn't already done it for you). If there's a song or album you think a friend on Spotify would like, just drag and drop it over their name and zap it to their inbox (as free invites start germinating, you'll start to see a much bigger crop of friends in your sidebar). You can share playlists, subscribe to other people's playlists, and even start a collaborative playlist with others. The premium plan not only lets you sync with smartphones and tablets through the Spotify app (Android and iOS), but also only cache tracks from the streaming library for offline listening. Your local files will be siphoned into the Spotify app as well. And even better, you can cache songs within the desktop app for offline listening, too. It's not that any one of these features is unique in the streaming music space, it's just that Spotify has combined as many of the good ones as possible, and made them work in harmony (mostly). Spotify's main draw over the competition—even more than the free access—is the ability to meld your local library with Spotify's streaming catalog. For the most part, it works. A better-defined home for my streaming collection of tracks would have been nice, like Rdio does, but the Starred playlist works as an alternative. The freemium model is great for people who just want something to listen to at work, but generally don't care about music on the go (and don't mind ads). It will become more limited in the future, but six months is plenty of time to hook people in. And this free model will almost assuredly provide a large circle of people who to share tracks with. If you like a song, you can send it to anyone who activated the social service. When you install the Spotify app on your smart device, you can sync wirelessly which is nice, if a bit sluggish. And like mobile sync, desktop caching is great if you know you'll be using your computer somewhere without an internet connection. Spotify could afford to embrace visuals more. MOG and Rdio have interfaces defined by big, interactive buttons, and use album art whenever and wherever they can. Spotify models its design more in the vein of iTunes, which is to say that it's text-heavy. Spotify also focuses too heavily on the idea that listeners only care about songs and not albums. And maybe it's just the music nerd in me, but all of my habits revolve around albums. There's no way on the desktop app to browse through album art tiles when looking for something to listen to. On the mobile app, you can't browse your collection by album at all. On the social side of things, outside of your Facebook friends you can't find other users unless you know their username and the boolean search code snippet, and you can't find other Spotify users or view their profiles within the app. Their entire social ecosystem revolves around Facebook. A service like Rdio has a far more robust social backbone with stats on what your friends are listening to, adding to their libraries, and listening to frequently. For a company interested in giving users music discovery tools, this seems oddly undeveloped. And then there are library stats (or a lack thereof). Spotify does provide a list of recently played tracks, but I'd like more fleshed out metadata on things like album/artist/song play counts. That's nitpicky more than anything else, though. One complaint that's not so nitpicky is Spotify's decision to not have a web-based music player. The beauty of the cloud-based music services is the idea that you can login from anywhere and access your music. Granted, Spotify is all about mixing local and cloud music, but it'd be nice to have a browser-based option if, for whatever reason, you can't use your own phone or computer (maybe you're hanging out at a friends house and want to play music through their computer). It certainly doesn't damn the service to mediocrity, but it is something that their competitors can brag about. 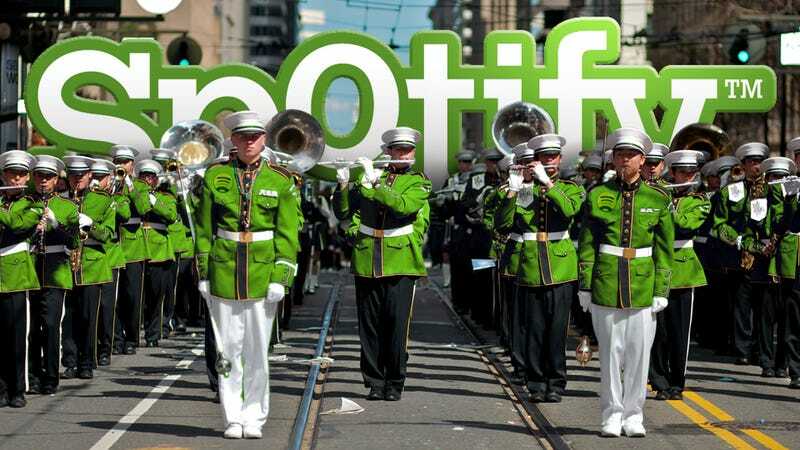 Ultimately, however, Spotify understands the streaming music space better than anyone else trying to get their foot in the door, and they've succeeded in delivering the same quality service in the U.S. that gained them so much acclaim in Europe. Who knows whether or not this will ultimately be profitable for the music industry, and really who cares? Even with the Spotify's weird little quirks, it's the streaming music service you'll want to subscribe to.